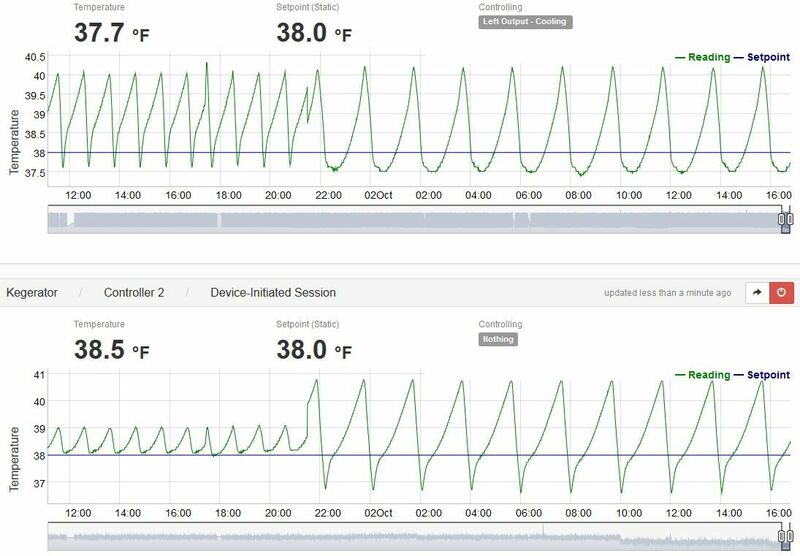 After my last test on the effects of a recirculating fan on kegerator temperatures (See: Kegerator Beer Line Temperatures & Reducing Foam with a Recirculating Fan), I decided to test the effects of kegerator temperature probe placement. I went with three configurations: Immersed vs Ambient Non-Immersed vs… Zip Tied to a Beer Can. Those tests yielded some interesting findings. For this test, the probe was zip-tied to a 14.9 Ounce Can of Beamish Irish Stout. This is the technique I’ve used for years. At the time, I wanted something with some mass to help regulate temperature and I didn’t want to have to mess with submerging the probe and the required container of liquid. For this test, the can was placed close to the wall of my keezer on the compressor hump. The second probe was immersed in 500 mL of water in a Lab Container. See the picture in test 2 for more info on placement. I also placed a ChefAlarm Thermometer & Timer in my keezer – Hands on Review – as another point of reference, giving me an ambient temperature reading. 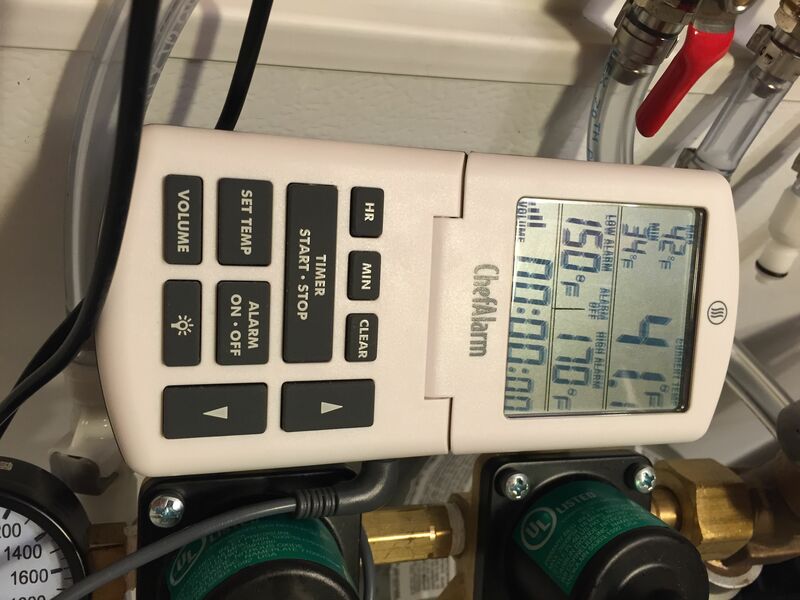 The ChefAlarm has some great features, including high and low temperature logging. Those highs and lows are what I used as a reference. Here are the temperature results for test 1 – zip tied to a can. The top shows the temperature probe zip tied to a beer can. The bottom, for comparison, shows an immersed temperature probe. This method produces and nice clean and reliable reading. High Temp: High temperature in deg F as measured by the primary/controlling probe. Low Temp: Low temperature in deg F as measured by the primary/controlling probe. Variance High to Low: The variance in deg F between general high and low readings from the primary probe. Cycle Length: Overall length of one typical cooling cycle, measured from high point to high point. Estimated Freezer Cycle Time: Estimated time that the freezer is running as measured from one high to the following low. Estimated Freezer Time: Hours Per Day: Estimation of how long my freezer would run in 24 hours based on frequency of cycles and freezer cycle time. Setup: I placed the probe immersed in about 500 mL of water one of my Bel-Art Scienceware 500 mL Polypropylene Lab Containers. I covered the top with aluminum foil. I have used these containers since 2011 for a bunch of things including yeast rehydration water (see tips page, tip #1), sample storage and more. That container was placed in about the same spot as the can used it test 1. Also Pictured: Eva Dry E-500 – Hands on Review – to handle kegerator condensation. Here are the temperature results for test 2 – immersed. The top shows the immersed temperature probe. 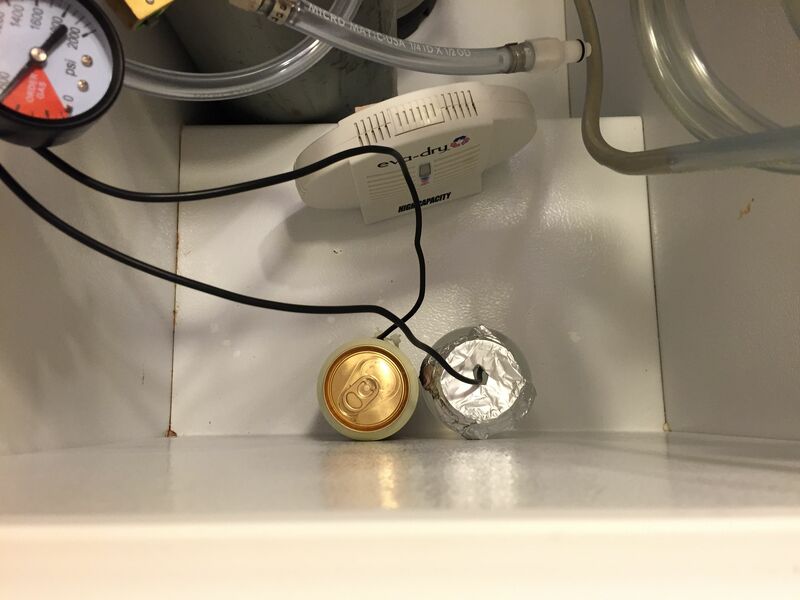 The bottom, for comparison, shows the probe zip tied to a beer can. Notice the stuttered temperature changes toward the bottom of this cycle. It doesn’t happen every cycle, but periodically, it also comes close to flat lining. That period of flat lining can last up to 18 minutes. The mass of the water makes temperature readings inefficient. That’s what we want to some degree. We want some sort of a buffer to give a good representation of temperature without quick swings. However the stuttering temperature changes along with flat lining, make me think that this method has it’s drawbacks. Here are the temperature results for test 3 – ambient, non-submerged. The top of this graph shows the ambient probe, the bottom, for comparison, shows a probe zip tied to a beer can. The left most portion of the graph is part of a previous test, disregard that. The middle portion shows the ambient non-submersed probe with a recirculating fan. By the way… all previous tests were completed with a fan. The right portion shows the same test, without the fan. I’m not reporting those results here. That test was much as you would expect it to be. Similar to the fan test, with larger swings and slower cycles. Thoughts… I was actually impressed with the consistency of the ambient air results. When I first looked at the graph, I noticed the semi-wild start of the test and I thought… here we go… this one is going to be all over the place. However, when it settled in, it was very reliable. It also has good accuracy. The difference between the zip tied readings and the ambient readings are small. The downside of this method is how often the freezer kicks on. This method had the shortest cycle length, by far, at just 27 minutes. It also had the highest estimated freezer utilization at 5.3 hours per day. The submerged test produced the longest cycle length, by far. Nearly twice as long as the zip tie test and four times the length of the ambient test. It had middle of the road temp variances (compared to zip tied) but it’s ChefAlarm (ambient air) test showed a whopping 13 degrees difference. Those swings are the result of how much time the freezer has to stay on to overcome the mass of the water used in the immersed test. That mass also causes inconsistent temperature readings and periods of flat lining. The ambient test produced good accuracy (second best variance and best ChefAlarm ambient air varience) but the short cycle length of 27 minutes means your freezer is kicking on a lot. That shows up in the estimated freezer hours per day… 5.3 hours, the highest of any method. I think the zip-tied can approach provides a good middle of the road solution. It provides the best accuracy, based on it’s 2.39 degree temp variance, has a middle of the road overall cycle length, middle of the road freezer run time and uses the least amount of energy with an estimated 4.6 hours of freezer run time per day. The can also offers the benefit of not having to mess with containers of water or other liquids. It’s also easy to move and reposition when cleaning or reconfiguring your kegerator. Some Additional Notes: These tests are with my equipment. Your results will vary based on a lot of factors including freezer/refrigerator, temp controller, amount of liquid used, probe placement, etc. In spite of those variances, I think these tests give you a good general idea about probe placement. I used a BrewBit Model T, sourced via Kickstarter, to log temperature. This entry was posted in Draft, Experiments, Kegerator, Reviews & Top Posts, Temp Control, Top Posts on October 13, 2014 by admin. Zip tied around the beer can to the koozie around the beer can? If so what were your results? I’d expect the koozie may fall somewhere in between probe submerged in water and zip tied to can. I’m trying to dial in my edgestar kegerator now with an inkbird and debating what routes best. Any opinions? Also what cooling differential was used for the inkbird for your study? 3f? One factor that is missed. Of course, given time, any beer that is in a static state will eventually have a temperature consistent with the ambient temperature. HOWEVER, I think this experiment neglects that more often than not, homebrewers are using their temperature control for FERMENTATION, and active fermentation is a exothermic process, where the yeast are putting off heat as they actively ferment beer, causing the wort temperature to be 3-5 degrees higher than the ambient temperature. So, this experiment only means something when there is no active fermentation. During an active fermentation, I would suspect that an immersed probe would be much more accurate than something anywhere outside of the fermentation vessel. It would be most interesting and relevant to conduct this same experiment on an active fermentation. This post only addresses temperature probe placement in a kegerator. Maybe I should change the title to clarify that. I think you’ve got a great point with regards to temperature probe place for fermentation. Nice article! Your work is very helpful and a great start! What temperature is the center mass of the fermenting beer? During budding, vigorous fermentation or finishing? Where is the best ‘middle ground’ to place the probe during these stages? The Barely Man – Chris. An interesting point about using a thermowell is that the reading of the temperature definitely seems to be affected by the temperature of the entire length of the cord coming to the thermowell from the temperature probe. I have noticed that the ambient temperature of the keezer affects the cord, especially when that temperature probe is placed outside of the keezer (thus the temperature outside of the keezer also affects the reading). 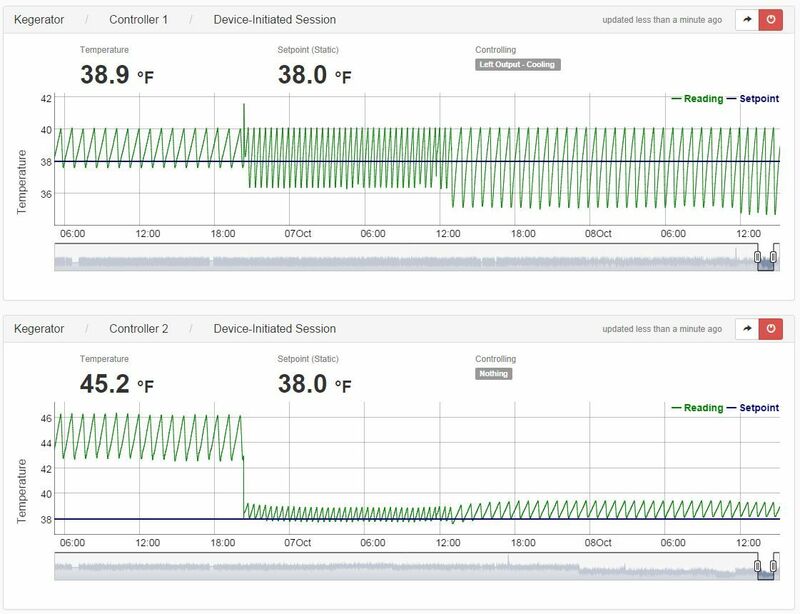 I noticed this when I had very inconsistent results while using a thermowell to measure the temperature of the beer as my keezer went through its cycles in a test similar to the above study, but only with regard to ambient temperatures. It would be most interesting to do experiments on this aspect also (i.e. to check the accuracy of the thermowell temperature reading when the cord leading to it, is subjected to different temperatures). After thinking about this some more, I think insulating the probe on one 5 gallon carboy in a refrigerator set for either 50 or 68 is different than having several kegs in a 15 cu ft keezer (more than 15 cu ft with the added collar) set at 38. I suspect that with the probe tied to the beer can it’s measuring a mixture of can mass temp and ambient. Insulating it would make it act more like the immersed probe and cause the cycle length and time to go up. I assume this is because the ambient temp would have to go up considerably in order for the temperature of the liquid to rise. Anyway, I’ve been measuring ambient temp so far with a Johnson A419. I have to set at 41 with a differential of 2 degrees to get it to stabilize at 37-38 so it cuts on at 41 and cuts off at 39. Currently its cycling too often. So I’m going to try your technique with the probe tied to a beer can and add a fan and the de-humidifier. How do you have your controller programmed? I think you’re right on. On the kegerator, I have it set to a 2 degree differential. Any reason why you don’t put a piece of Reflectix or similar insulation over your temp probe on the beer can to completely isolate the reading to the can? That’s how I do my fermenter in my fridge. I put the temp probe under a piece of Reflectix insulation and strap to the carboy. I believe it gives a more accurate reading. This is a great site and great articles. The how-to’s and tips have been very helpful. Thanks a lot! Hey David! Thanks for the nice words! It would be interesting to try. The more mass and insulating you have on and around the probe the slower the controller will be to react. The slower it reacts, the wider the temperature swing will be. I think there is a sweet spot with just the can’s mass. It’s possible a piece of insulation could help the overall pattern, it would be something good to test. I have a similar setup as David, but instead of reflectix I just use a can koozie. Can of soda in a koozie, and just slip the temp probe down inside. I wonder if that might be worth testing vs. ziptied to a can, see if there is a isolation effect and whether that is better or worse than more ambient exposure. Would you consider these findings a valid starting point when using a freezer with temp control as a fermentation chamber? Or would you be better of relying upon the “tape it to the fermenter in bubble wrap” approach? That’s a good question and a great idea for another experiment. I wouldn’t suggest changing your fermentation probe placement based on this (yet). I just tape or rubber band the probe to my fermenter for that. I suggest you keep doing what you’ve been doing for now. I’ll put this in the future experiments hopper. Thanks Dean! 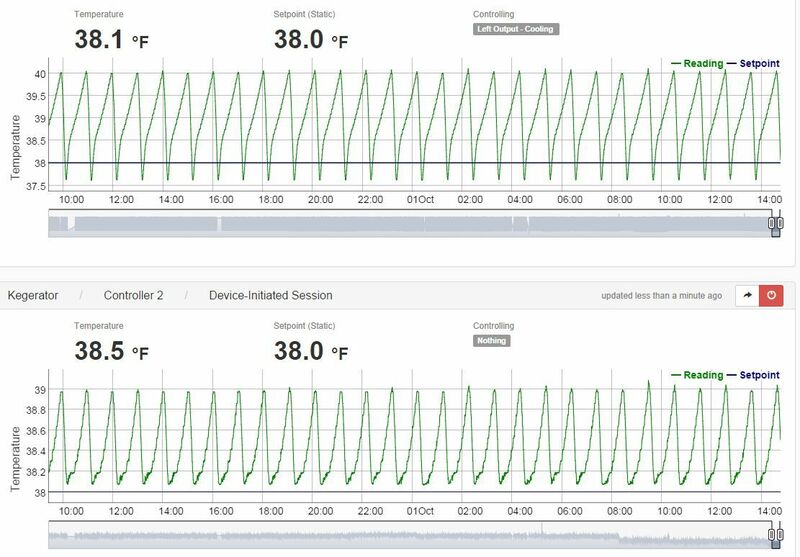 I think one thing that you are overlooking is the variance of the temperature with the probe ziptied when controlled by the ambient probe (last image, bottom graph, middle segment). If I am seeing that correctly, there is only a variance of about 1 degree. So while you are cycling your freezer more frequently, you appear to be getting smaller temperature swings in your beer. Better yet, do all of these tests with the second probe taped to your keg. My guess is that the temperature variance is going to be very small/negligible for all of these methods, meaning go with the easiest/cheapest/best for the life of your compressor. In the post… “I was impressed with the consistency of the ambient air results”. What you’re saying is true. I believe the ambient probe produces quick, accurate results. The zip tied can temp is tight and the ChefAlarm variance is the lowest of any method at 4 degrees. However, the ambient differential is the highest of any method at 3.62 degrees. Whether or not it is the most accurate, the down side is how often the freezer is cycling on and off. I am skeptical that all methods will produce small/negligible differences, especially the submerged probe. A 13 degree ambient temperature variance and 2 hour cycle length is going to produce some changes in a keg of beer. I completely agree with you that the appropriate conclusion here is to measure temp based on the zip-tie method. Here is my conclusion based on the data, and the assumption that this is just for serving and no fermentation is occuring (i.e. the water in the flask/beer in the can, are at the same temperature as the beer in the keg). I think that the most accurate way to control the temperature of the chamber is with the ambient air probe. This ensures that the air temperature is always between the set points. Of course that comes at the cost of increased freezer run time/cycles. The worst way to control the temperature would be immersion or a good insulated tape job to the keg. The reason that you see huge ambient air temp variations is because the immersion is too good at maintaining temperature. It requires the chamber to heat up the most to see the temp start to rise in the immersion probe. This also explains why the immersed probe test had the longest cycle (takes a while for the water temp to rise enough, then takes a while for the water temp to cool). 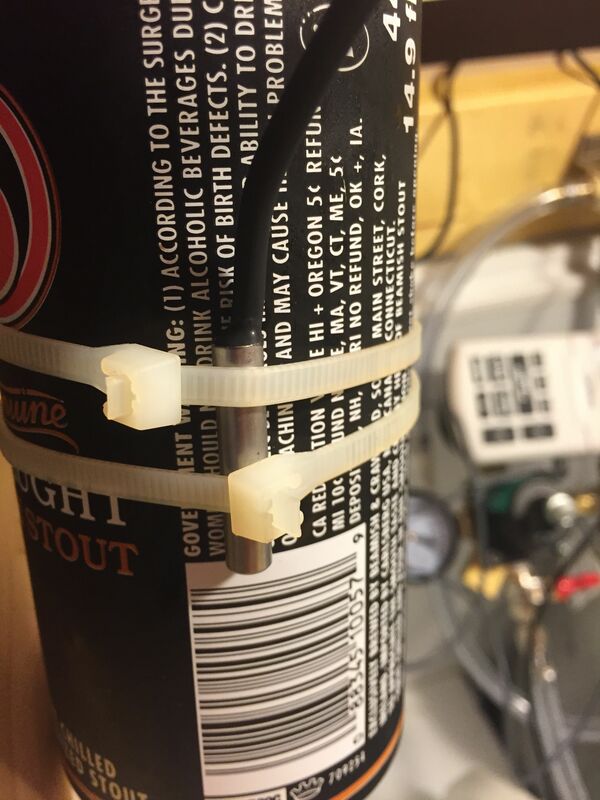 So your zip-tie method is the best of both worlds, you get decent temperature fluctuations since the probe is exposed to the air, but it is stabilized by the thermal mass of the beer in the can. You can see that the variance of the immersed probe, while controlling for the zip-tied probe, is nearly 1 degree. If you were to re-do this experiment (and maybe I will try it myself). I would have probe 1 subjected to each “condition” and then use probe 2 taped to the keg, every time. Then measure the variance of the actual beer. You bias the results when you measure the same thing that you are controlling (eg. measuring the chefalarm while controlling the ambient temp). It isn’t surprising that the ambient air temp has the lowest variance when you are controlling the temp based on the ambient air temp. Does your temperature controller have a setting for a target temperature once it kicks on the compressor? For example, those cheap chinese ones default to 2 degrees over your set point (i.e. freezer turns on at 40, runs until it hits 38). If that is true for this, then the variance is biased again. The variance for a ziptied probe when controlling by the same probe will be at least 2 degrees. I would also recommend changing the Y-axis scale if you can, so that they are all the same. I didn’t realize that the immersed probe when controlling for ziptied probe only had a variance of about 1. I don’t mean to be critical of your experiments, I really love that you are doing them. I think I got a little excited while typing up that last response. I’d be happy to discuss this (and other experiment ideas) with you if you are interested. No worries Adam. I appreciate your thoughts. I think we’re basically on the same page with a few tweaks as far as approach to the experiment.